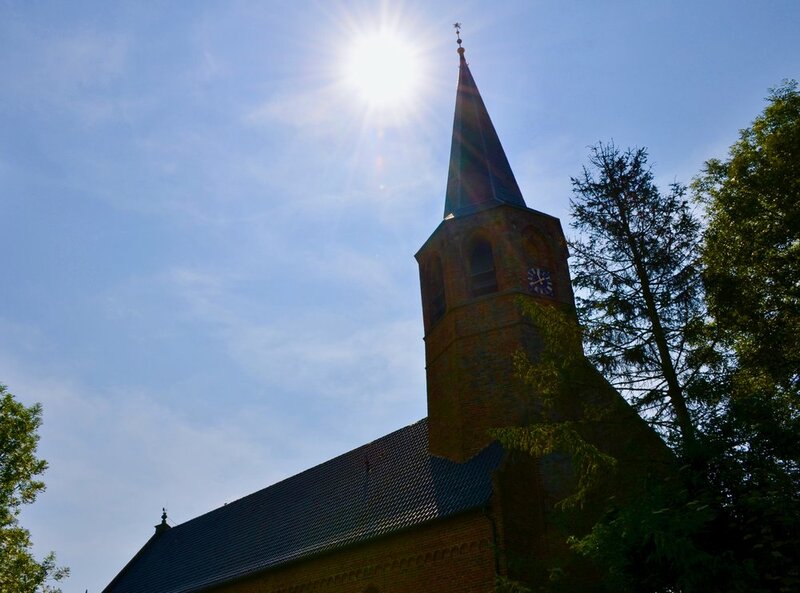 The village church in Kantens, Holland. We woke up early today (all still rather sleepy) and were soon off to see more historic organs. We drove by the now familiar Dutch countryside full of sheep, cows, and horses and arrived at a little village called Kantens. Erwin Wiersinga, our gracious host with whom we had spent the day yesterday, was waiting for us at the small village church there. The organ at Kantens was built in 1667 by Hendrick Huis, teacher of famed organ builder Arp Schnitger. It was later enlarged in 1670 with a Rückpositiv. After the church went bankrupt in 1817, the organ was taken out from the church and some of it was severely damaged. Thankfully, it was not sold and was later put back into the church by Johan Wilhelm Timpe. However, the pipes of the Ruckpositiv division were not put back in and were probably destroyed. Most of the organ was again removed in 1954 and stored in the church rectory and village fire station. In 1986, after the organ had been taken out of the church for 32 years, Jürgen Ahrend reconstructed it as a two-manual organ with Hauptwerk and Rückpositiv divisions. The Hauptwerk division comprises mainly original pipework while the Rückpositiv division comprises new pipes. 1667 Huis organ, Kantens, Holland. Erwin demonstrated the beautiful sounds of the organ for us. 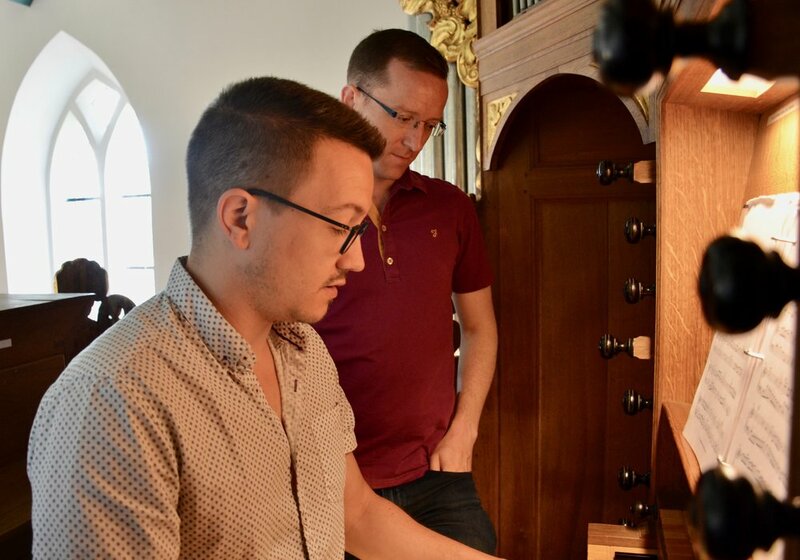 Then, we each had a turn playing on the organ, mainly playing works by Jan Pieterszoon Sweelinck, a Dutch composer, organist, and teacher who lived from 1562-1621 and had great influence in shaping the north German organ school. We remarked on the adjusted meantone tuning of the organ, to which many of us were not accustomed. The organ also had a short octave, a tactic to save money and space. As we were playing, a couple of people from the village brought in many beautiful hand-made quilts for a quilt show that so happened to be taking place in the church later that day. As they were hanging up the quilts, some of us wandered among the beautiful tapestries, listening to the equally beautiful and varied sounds that were coming from the organ. 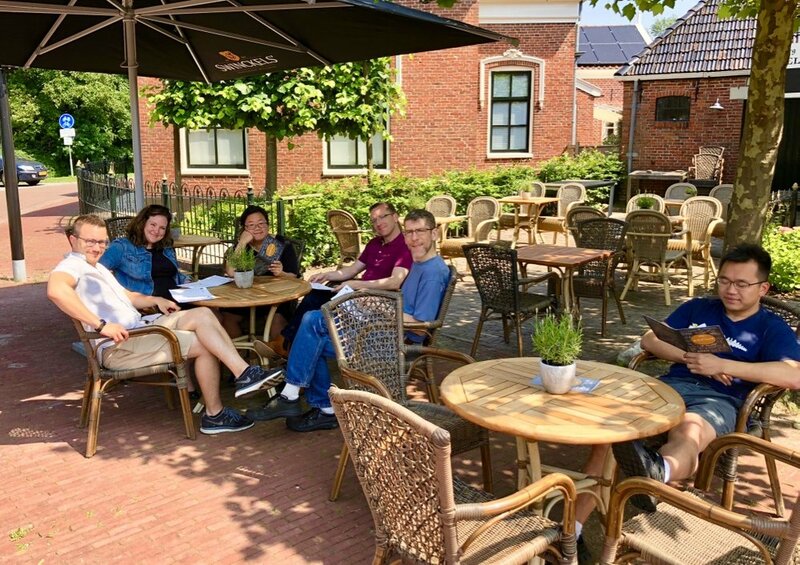 After playing at the organ at Kantens, we had a quick lunch at a quaint village restaurant in Mittenstum called “De Valk.” It seemed that they made many of their menu items from scratch, including their fries and Groningen mustard soup. After quickly eating our lunch, we headed to the next organ, which was in a village called Zeerijp. The 1651 Faber organ in Zeerijp, Holland. The church here was built in the 14th century and has very resonant acoustics. The interior was made of stone but painted to look like red brick. The organ was built by Theodorus Faber from 1645-1651. 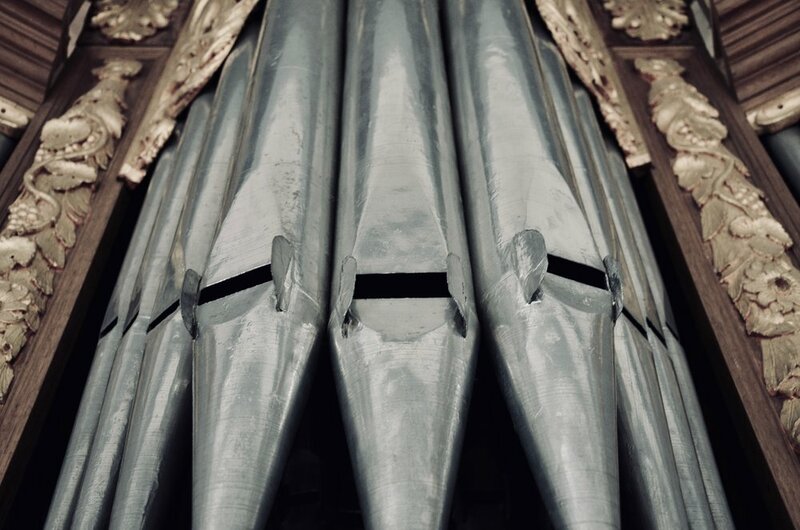 In the 19th and 20th centuries, the pipes of the organ were completely removed. The organ was reconstructed in 1979. Today, the remarkably beautiful organ case and 16’ Bourdon are still original on this organ. After Erwin wonderfully demonstrated the organ to us, we took turns playing works by Sweelinck, Scheidt, Buxthude, Froberger, and Weckmann. This organ had a couple of fun stops, including the Nachtegall (“nightingale,” a bird-like stop which requires water in order to function) and the Trommel, a drum-like stop which many of us had never experienced before. Erwin Wiersinga coaches Jennifer Hsiao on the 1823 Lohman organ in Farmsum, Holland. The third and last church we visited was in a village called Farmsum. The organ was built by Nikolaus Lohmann in 1828, considerably later than the other two organs we had seen earlier in the day. The church was built anew in a classical style in 1869/70. We noticed that the railing of the organ loft was peculiarly built in front of the Rückpositif divison rather than behind, as is usually the custom. Erwin remarked that this was because the architect wanted to “get rid of the old-fashioned furniture” (i.e. the organ). The organ was restored several times in the 1970s. The organ was re-inaugurated in 2016 after being silent for five years for various reasons, including the discovery of interesting grave artifacts and an earthquake. 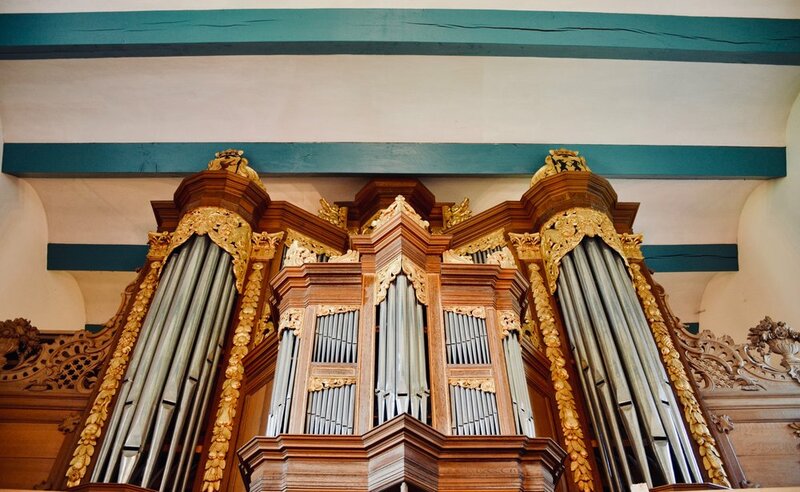 This organ is one of the few high-quality instruments in the north where one can play later music. We took this opportunity to play works by Karg-Elert, Mendelssohn, and Bach. Erwin coached Brandon, Jennifer, and Cho on Bach’s Vater Unser, Pièce d’Orgue, and little fugue in g minor. After we finished playing this last organ of the day, we reluctantly parted ways with Erwin, who had been our wonderful host for the past two days. He gifted us with two CD albums that he and his colleague had recorded at Groningen’s Martinikerk and we happily listened to them on the way back to our airbnb. When we arrived back at our airbnb, we noticed that the sheep had all left the farmand and we wondered if we would see them again before we left. Our evening was noticeably quiet without our sheep chorus serenading us. Chris, Corey, and Jennifer went out for another canoe and kayak ride in the canal next to our farmhouse while Brandon, Chelsea, Chris, and Cho prepared a delicious meal of pasta with pesto and sausage, rice with pesto and cheese, and salad. After we ate dinner, we enjoyed some wine and ice cream and then went to bed relatively early so that we could wake up super early tomorrow morning to drive to Hamburg, Germany. 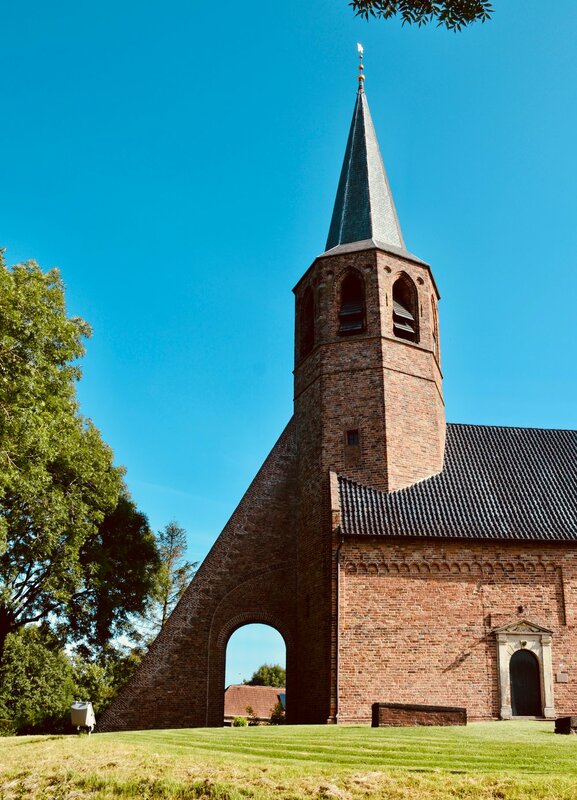 The village church in Kantens, Holland, with an indiscreet tower support. Brandon Santini and Erwin Wiersinga outside the church in Kantens. Corey De Tar outside the church in Kantens, Holland. The 1667 Huis organ in Kantens, Holland. 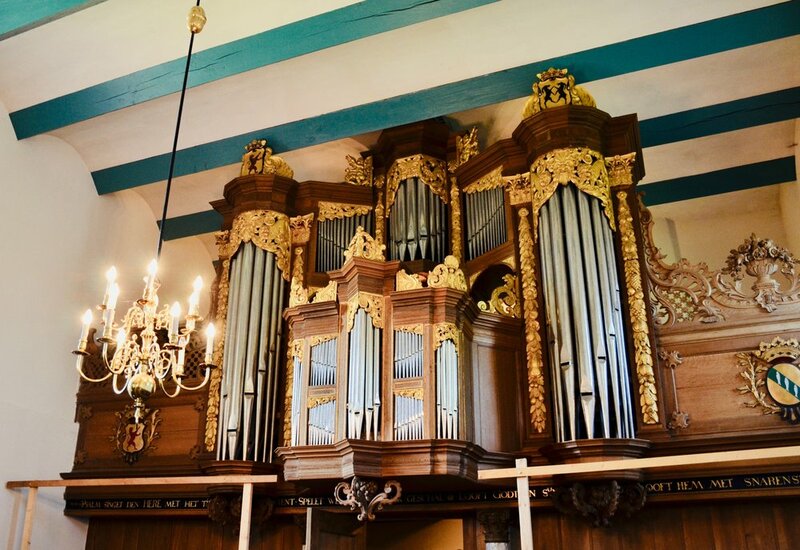 1667 Huis organ in Kantens, Holland. 1667 organ in Kantens, Holland. Corey De Tar in Kantens, Holland. Christian Lane in Kantens, Holland. Pipework detail, 1667 Huis organ, Kantens, Holland. Corey De Tar and Christian Lane in Kantens, Holland. Pipework detail, 1667 pipe organ in Kantens, Holland. Adrian Cho is all smiles in Kantens, Holland. The church in Zeerijp, Holland. The 1651 Faber organ, Zeerijp, Netherlands. 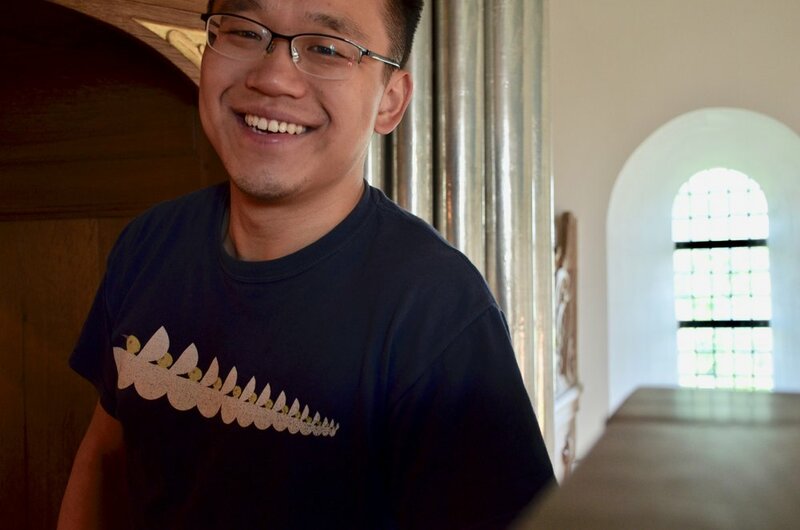 Adrian Cho at the 1651 Faber organ, Zeerijp, Netherlands. Members of Boston Organ Studio in Zeerijp, Holland. 1823 Lohman organ, Hervormde kerk, Farmsum, Netherlands. 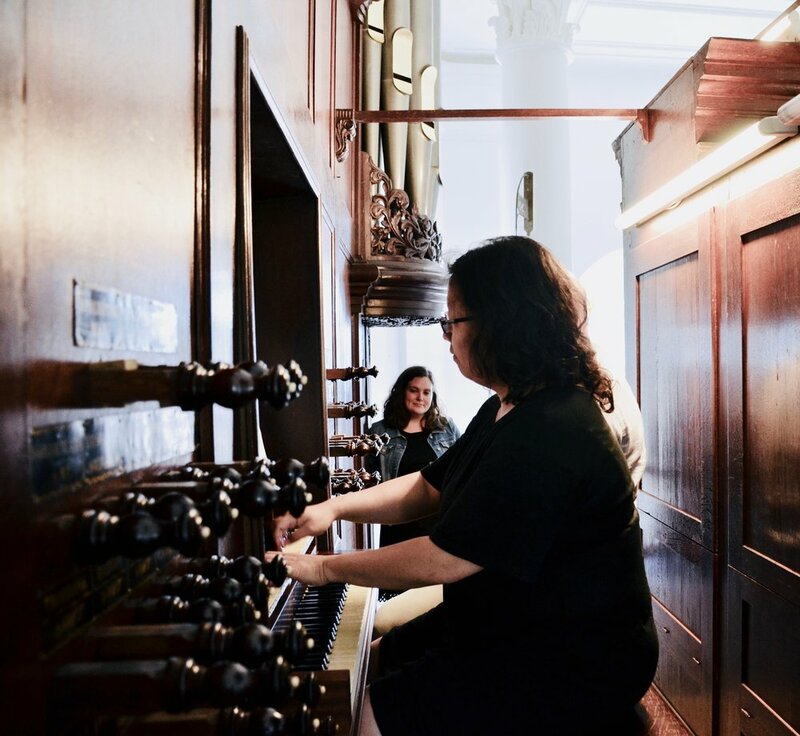 Jennifer Hsiao at the 1823 Lohman organ, Hervormde kerk, Farmsum, Netherlands. Erwin Wiersinga and Jennifer Hsiao at 1823 Lohman organ, Hervormde kerk, Farmsum, Netherlands.